As an adult, there are lots of things you have to leave behind: a diet of candy and soda, afternoon naps, sudden crying fits in crowded restaurants (maybe not that one?). But you're also able to afford as many Nerf guns as you want, and this is close to a fair trade. To aid yourself in this therapeutic acquisition, check out Amazon's huge Nerf gun sale, appropriately titled Nerf Fest 2018. 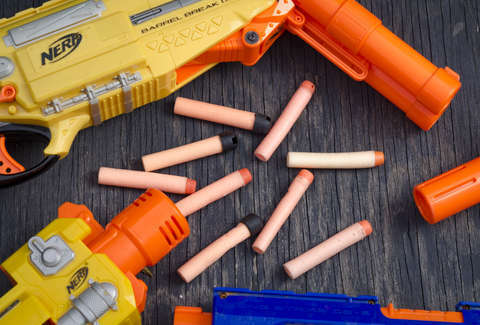 The sale, which Kinja reports is today-only, spans the entire Nerf universe, from baroquely constructed cannons to skateboards. And nothing is going to make you feel like you have a second lease on life like a Nerf skateboard. There's even a whole section for dog-related Nerf products, like a gun that shoots a ball for your dog to fetch in case you're looking for a more, you know, practical purchase. But the point isn't practicality. The point is to get something your parents would never buy for you. For instance, the Nerf N-Strike Elite Infinus for $46.11. Are you spending almost $50 on a toy? Sure. But this "fully motorized Infinus blaster features motorized Speed-Load Technology that automatically loads darts in the drum." And you want that. Or you could drop $10.49 on a Nerf Doomlands 2169 Persuader Blaster, which in size and price is more reasonable but also has three barrels stack on top of each other so it doesn't look reasonable at all. There are also some T-shirts, walkie talkies, and even a Go-Kart included in the sale. So take that, mom and dad.